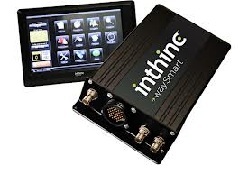 USA: inthinc Technology Solutions has incorporated electronic Driver Vehicle Inspection Reports (DVIR) to its waySmart fleet management solution, offering managers one source from which to manage vehicle operations. Developed in accordance with U.S. and Canadian federal safety rules and regulations for commercial carriers, inthinc DVIR simplifies pre- and post-trip inspections while also reducing the inaccuracies and administrative overhead associated with paper logs. Automated electronic inspection reports are sent directly to each vehicle where drivers receive an in-cab verbal reminder to complete a safety inspection before and after each trip. Upon completion of the report — via an onboard touch screen mounted in the vehicle — the data is sent directly to the fleet manager via cellular communication to the web-based inthinc.com Management Portal. inthinc DVIR is completely configurable from the inthinc.com Management Portal, allowing fleet managers to customize multiple inspection checklists and automatically distribute to proper vehicles. inthinc DVIR is now available as an integrated featured with inthinc waySmart — a comprehensive fleet management and safer driving safety solution designed to provide fleet management detailed performance and trends for individual drivers or the entire fleet. Using a unique combination of GPS tracking technology and real-time in-vehicle driver coaching, the waySmart solution has proven to deliver immediate results including fewer accidents, improved fuel efficiency, reduced CO2 emissions and potentially millions of dollars in reduced costs per year.